One of the best ice skating rinks in West Valley City, UT, Acord Ice Center Ice Skating Rink is a 1 sheet indoor ice skating rink is open year round. It was founded in 1999. Ice skating sessions for All Ages are one of the main attractions at Acord Ice Center. Ice Skating provides great exercise and an opportunity to get out of the house – plus, it is not like exercising at the gym… skating is fun! Lace-em up and come join the others. Get on the ice and get ready for a great experience. If you do not see the rinks public ice skating schedule posted, be sure to contact them at (801) 966-0223 for their public session times. If so, the folks here love to teach and their instructors are top notch. For beginners they usually focus on providing the basics. For more advanced skaters they focus on proper form, technique and getting you ready to meet your goals. Call Acord Ice Center at (801) 966-0223 for more details. Acord Ice Center Ice Skating Rink offers ice hockey leagues for all ages. Acord Ice Center Ice Skating Rink hosts ice hockey tournaments forall ages.at their facilities. Call Acord Ice Center at (801) 966-0223 for more details and to look into upcoming tournaments. Acord Ice Center Ice Skating Rink offers camps and clinics for youths.to help you improve your game. 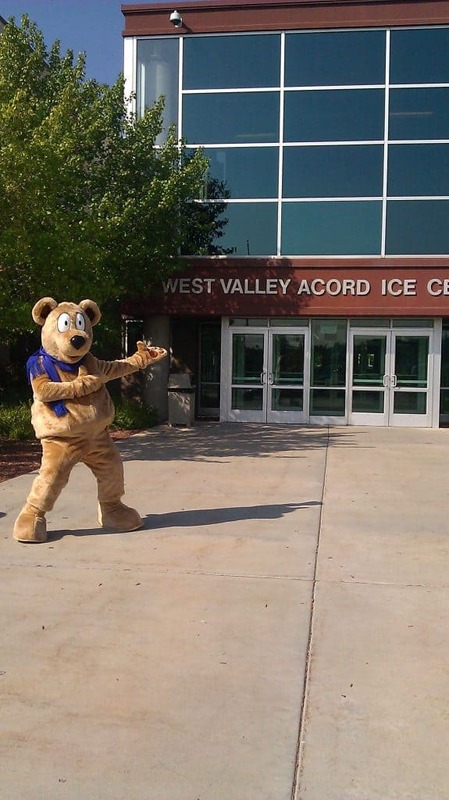 Call Acord Ice Center at (801) 966-0223 to learn when their next ice hockey camp or clinic is being held. Acord Ice Center Ice Skating Rink offers pickup ice hockey for adults.Give Acord Ice Center a call at (801) 966-0223 to inquire about their pickup hockey schedule if it is not listed in the description or schedule here. Why not have your party or event at Acord Ice Center? They can make their rink and other facilities available to you for birthday parties, holiday parties or corporate events. Their prices are great. They would love to have you out. Give them a call if you would like to schedule your event now at (801) 966-0223. Please call at least one week in advance to properly schedule your event. Got the munchies? Acord Ice Center provides food and beverages in the snack bar. If your are looking for new ice hockey, figure and other skating equipment or services, Acord Ice Center can help. The Acord Ice Center pro shop offers a wide array of products and services. Stop by for a visit next time you are at the rink or contact them now at (801) 966-0223 to see if they have what you are looking for. I booked my sons birthday party here 3 wks ago and was told I could come in Monday to pay the deposit and sign the contract. When I called in on Monday Oct. 17th to pay the deposit and go in I was told my reservation was given away. They didn’t even contact me to tell me this and 4 days before his party. I was livid. I got the manager on the phone she said because the contract wasn’t signed it was given to someone else I explained to her I was told I could come in on Monday to do that. They refused to honor my reservation but instead she guaranteed me the same room Saturday Oct. 22nd from 5-7pm with 30 skate rentals to make up for their screw up. I hired a face painter to paint the kids faces and she got there 10 min before I arrived only to find another party just setting up in the same room I was GUARANTEED to have because of their previous screw up. I immediately went into the office and ask that they be removed because that room had been promised to us by the manager. Well guess what they double booked it yet AGAIN!. I was pissed I asked for them to call the manager in immediately we couldn’t set up, guests where arriving, NOTHING WAS READY!. I asked them what the hell was going on and how the hell this could have happened again. Come to find out the people in our room never signed the contract but I did , the so called same contract that I got kicked out of my original date for not signing but yet these people where allowed to take our room with no contract. The whole reason we got kicked out of our reservation and was forced to move our date and time 4 days before my sons party was because of that pos contract. They wanted to shove us the ones who had a contract into the locker room. Are you freaking kidding me !!! The locker room when we where guaranteed that area by the manager herself. Why where we forced to move yet again because of their screw up. We finally had to cave and set up in the main area because apparently these employees could not do their job correctly and people where showing up. Finally around 6:00-6:20 the coordinator decides to grace us with his presence, asks if I can go to the office to “talk about it”. He apologized which we where literally passed that point and offered to remove the other party with only 40 minutes left of our reservation. Good job buddy they should have been moved from the get go. Then he offers a room clear over in the Rec center are you serious?! Yeah let’s just leave a bunch of kids from ages 3-12 by themselves without parents. While we are in a completely different building. I WILL NEVER BOOK HERE OR RECOMMEND THEM TO ANYONE !!!. My face painter I hired also said the same she could not believe it, She recommend they be fired. She was blown away. She told me she will never refer a client here and warn others who book here after this. Not once but twice where we completely screwed over here and all in less than a few days. I seriously could not believe it nor could any of our guests because they knew what happened to begin with. What is a point of a contract for a room if they themselves don’t even abide by it.